Your Buffalo Wild Wings fan experience just got even better. 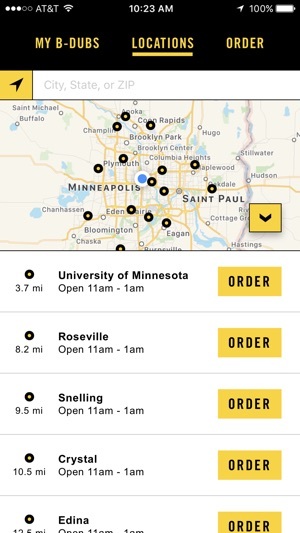 With our new app, you get a faster way to place your B-Dubs To Go orders at nearby locations, customize favorites from our menu, or repeat a previous crowd-pleasing order. It’s the easiest way to put your game plans into action, and we did it all for you, sports fans. Download it today. Update July 2018: The app has has a few “bug fix” updates, however the exact same problem is still occurring. Do not waste your time with this application. You will go through the entire process to enter your order only to be presented with a blank screen when you proceed to attempt a checkout. Take note that the Most Favorable ratings come from reviews over 5 Years old. Initial Review: Don’t be fooled by the interface of this application. 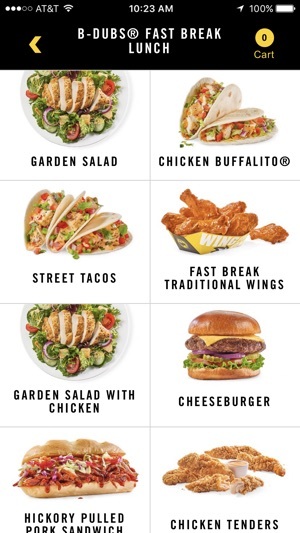 I do not know what happened behind the scenes but when you go to check out your order you will be presented with a white screen that will not update. This is been going on for so long, and many other reviews have noted the same issue. 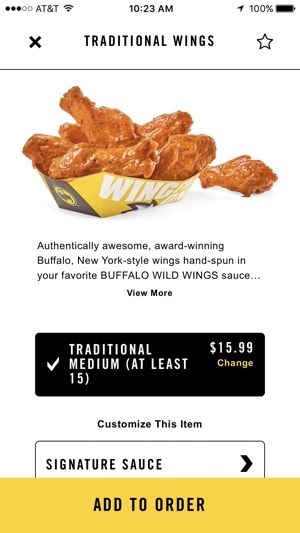 I’ve tried to reach out to the Twitter account for Buffalo wild wings and they do not ever reply or at minimum acknowledge this problem. But if I post a picture of a beer on the bar inside the restaurant, they have no problem replying within 60 seconds. I guess they don’t want money because calling the store, as anyone with experience knows, is always a guaranteed “please hold” for at least 3-7 minutes (my personal hold time Record is 9 minutes). I ordered wings for a co-worker and myself for lunch. We work night shift so our lunch is late, 9:30 pm. Ordered through the app, paid online- the app made me pay ahead. I get there and they can’t find the order, the check the computer and the kitchen- nothing. Ask if I have an email confirmation. I didn’t. I thought maybe my order didn’t go through, but I on the app it said “order received” and had a receipt. I couldn’t bring that up either because I checked out as a guest. At this point I couldn’t even wait for them to put the order in because I only get a half hour lunch. So I walked out, with no food. Before I got in my car though I decided to check my credit card app, to see if I got charged, sure enough there was a charge. So the store couldn’t give me a refund and the only proof I had was the charge on my credit card, so I left without food to eat for lunch, wasted my time going there and was charged. 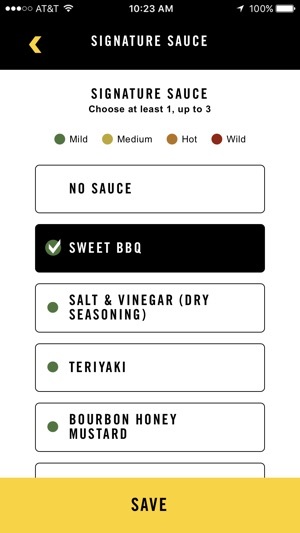 able to create all notes for any substitutions or changes to a menu item. I’m able to set a pick up time. When you call in - you can’t guarantee they understood you and if you tell them a time, more often than not, they put the food in anyway and it’s just waiting or you to arrive. Fix your app or just take it off the market. 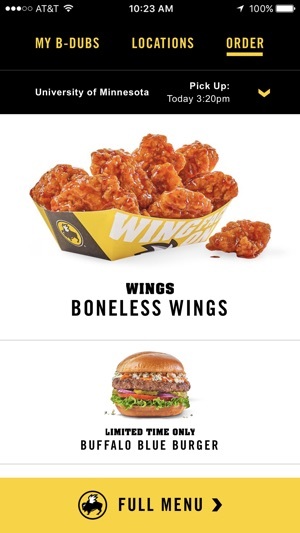 Copyright© 2016 Buffalo Wild Wings, Inc.